A group of French-speaking fans were looking for a cab to go to Belgium's World Cup game. Coming from the other direction on the famed Avenida Paulista, Flemish-speaking fans were loudly looking for lunch. They crossed each other, listened — looked at one another's Belgian red shirts, and suddenly it was high fives and thumbs up. It was the sporting spirit of Sao Paulo, which is all too rarely the political spirit of the Belgian capital Brussels. For a country in the political throes of separatism, the World Cup is providing almost a surreal glue of unity. When Belgium's motto "L'Union fait la force — union makes strength," is increasingly turned into "L'Union fait la farce — Unity is the joke," the performance of the national team is lost on no one — in Brazil or at home. And it should not be lost on the United States too, the next opponent in an increasingly successful World Cup campaign. "My players will give everything for Belgium," said coach Marc Wilmots, a former senator who has defended the concept of a united nation. Prime Minister Elio Di Rupo, a staunch Francophone defender of Belgium in the face of the rising Flemish nationalist N-VA party, is loving every minute of the rise of the Red Devils, especially Tuesday's match against the United States. "Hey @BarackObama, I am betting some great Belgian beers that our @BelRedDevils will make it to the quarter final! :-)," he Tweeted after Thursday's 1-0 victory over South Korea. The political divisions back home make the U.S. motto at the tournament "One Nation. One Team." almost a taunt to Belgians. While the Belgian political arena is carefully divided down to the last parliamentary seat among the 6.5 million Dutch-speakers from northern Flanders and 4.5 million Francophones from the south, the national team is a mix of languages where a tally of how many Flemings and Francophones has become a thing of the past. Even Wilmots represents that unity because he is a Francophone married to a Fleming. The division between sports and politics could not be starker these days. While the national team keeps winning and the black-yellow-red flags are waved in unison, Belgian politics has again stumbled into crisis. Elections last month made the regionalist N-VA party even bigger in Flanders and predictably, government negotiations are bogged down in fundamental contradictions between north and south. Four years ago, elections spawned a record 541 days — yes, 1 ½ years — of negotiations before Di Rupo came became premier. Di Rupo is from poorer Wallonia, which traditionally leans in favor of national unity because the region would likely find it difficult to survive on its own economically. The N-VA has traditionally campaigned on a platform that Wallonia is a burden to Flanders, preventing it realizing its economic potential. At the World Cup, such things are scoffed upon. "We still don't have a government yet. We don't care. We will keep the country united," said Nicolas Lombaerts, the central defender during the victory over South Korea. And the fans think exactly like that. "There is only one Belgium, with Flemings and Francophones united," said Yves Hauglustaine, a Francophone entering retirement after a life of work for the national railroad company that shuttles masses across the linguistic border on a daily basis. And it is this contradiction between the way people vote and the way they feel in a country that cherishes surrealism as a national treasure that continues to baffle. "People vote totally different than the way they feel about football," said Kris Beyen of Flemish Leuven, all dressed up in red and ready to join the thousands of Belgians at the Itaquerao Stadium, and also unable to explain the yawning discrepancy. Political expert Dave Sinardet said it could be explained because politics have been hermetically sealed in linguistic camps, with a Flemish electorate almost never able to vote for Francophones, and vice versa. At the same time, football can only be successful when that divide is successfully bridged. 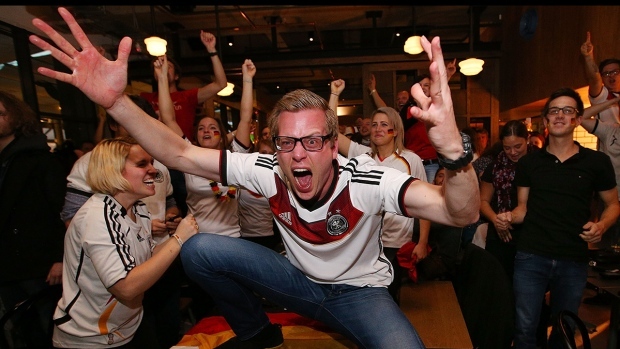 "To win a World Cup, there are strong incentives to work together," said Sinardet, a professor at Brussels University. It is rare when there is a common cause to cheer. Besides football, royalty is another one, but Queen Mathilde didn't help her cause when she mixed up the hero of the victory over Russia with the Belgian dud of the game during official presentations. "Belgians certainly are not the biggest patriots but the success of the Red Devils has brought those latent feeling to the surface," Sinardet said. It is what makes Wilmots so proud as a coach. He especially loves that the victories are cheered with equal passion across the nation. Now stadiums in Belgium are filled with wildly cheering fans watching the games on a big screen, while the real action is half a world away. No so long ago, there was a time when the Belgian federation could not even fill a stadium for a live game, even giving away tickets. "They used to give away jerseys and they gave them back. Now, they fight for them," said Wilmots.